L gave me a couple of Reidel glasses for Valentines Day! The glasses are from the Vinum varietal-specific range. Reidel sez the shape of each glass is designed for an individual wine variety, and enhance the flavour and aroma of that wine when drunk from the appropriate vessel. I am not experienced at drinking from such expensive glassware, and couldn’t attest to the truth of Riedel’s claims, but I know that wines do smell and taste different depending on the glass. The experiment worked. The wine looked, smelt and tasted great. Not sure if it was the quality of the wine, or a placebo effect from the marketing and mystique around the glassware brand. We knew the wine would be good going in. L and I tasted it at the vineyard on a visit of Martinborough last year, and she bought a bottle to take home with her. It is named after the winemaker’s wife. We were having leftover Indian takeaway for dinner, and thought the gewurz spice would go down well. The wine is deep gold in colour. 13%. Honeyed and warm with spicy notes. Off dry. Very aromatic. The Reidel’s did what they promised on the tin, and presented a good wine very well. 4. 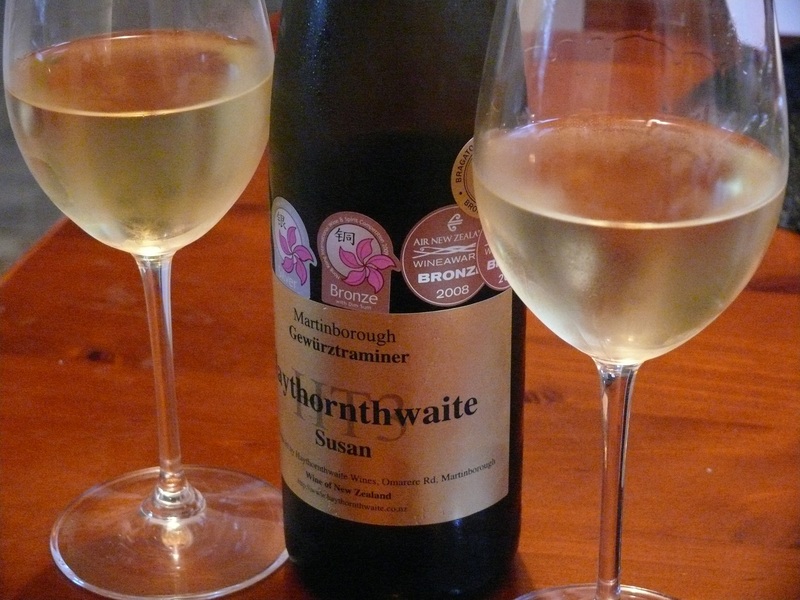 This entry was tagged $$$, 13%, 2008, 4, From the Cellar, Gewurztraminer, Haythornthwaite, Martinborough, Riedel, Vinum. Bookmark the permalink. Yeah. Lucky me. Riedel sez you should pay for one glass same $ you would pay for one bottle…save to say I rarely buy up to that level…!